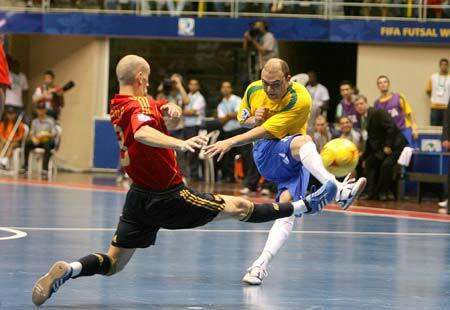 FUTSAL: Futsal giants Brazil and Spain set up a mouth-watering World Cup final clash in Thailand on Sunday with the Iberians determined to avenge their heartbreaking 2008 defeat to the champions. Both teams met in the finals four years ago with Brazil winning their fourth title in a penalty shootout. Four-time world champions Brazil held off a plucky Colombia in the their semi-final late Friday, with two goals from Gabriel helping them advance 3-1. Earlier Spain, current European title holders and runners-up in the last edition of the tournament, dispatched Italy 4-1 after a late flurry of goals to book their spot in the final. Sunday night's climax to 17 days of competition will be the fourth time the two sides have competed for the world title with Spain determined to make up for their penalty-shootout heartbreak in 2008. They are also the only two sides to win the World Cup since it began in 1989. "The game against Brazil is a repeat of the last final. We know we're a good team but we also know our limits. It's going to be very close," Spain goalkeeper Juanjo told FIFA.com website. Free-scoring Brazil have found the net 42 times in five games to the final, conceding just five, while Spain have scored 29 goals, with their defence leaking twice as many as Sunday's opponents. Italy meanwhile will look to secure bronze in their game against tournament surprise packages Colombia, who will be determined to leave Thailand on a high. The fiercely-contested knock-out stages have finally taken attention away from controversy that dogged Thailand's preparation for the event. Football's governing body FIFA forced Thailand to move the knockout stages -- including Sunday's final -- from a new $40 million stadium after construction delays meant the venue failed safety tests.